It's officially spring. There's no doubt about it. It's beautiful. It's warmer. There's more life. Flower and leaf buds are peeking out from the branches, the animals are in full activity, daylight is longer and nature is starting to color . 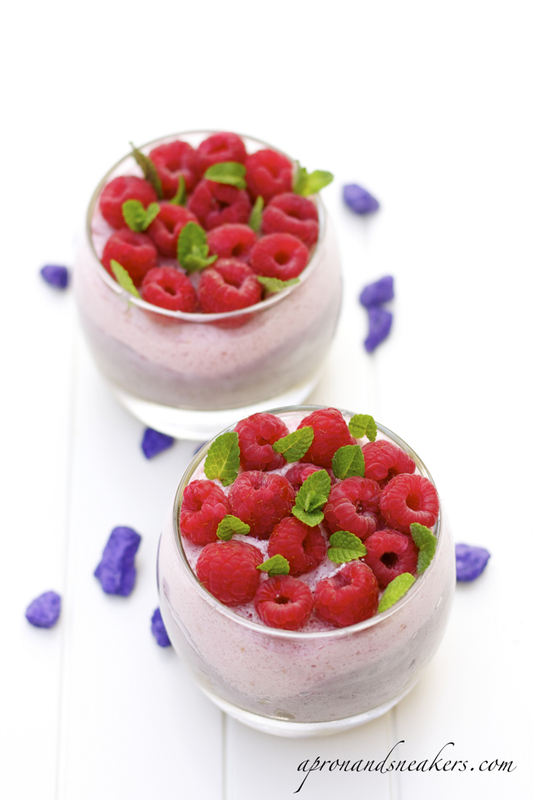 And this raspberry and blueberry mousse is my tribute to the most beautiful season of the year. After the cold, heaviness and grayness of winter, here we are, standing outside again, witnessing nature's wake up call. I'm blabbering about the beauty of spring but I would like to focus on one thing that I am truly rejoicing about. It's finally time to shed off those heavy wool clothes and stop quivering from the cold. I grew up in a tropical country with only one season. Summer. Well, there are two that we refer to, wet and dry. Wet means monsoons, typhoons and continuous rains and dry is eternally sunny without rain. It is always hot. Isn't that wonderful? There are no seasons to speak of. Autumn, winter and spring don't exist. There is no excited anticipation of the next season that's coming. There are no seasonal fruits and vegetables to wait for and there are no clothes to switch from season to season. It's summer 365 days of the year. Tropical fruits are so different and delicious. Beach day is all-year round (unless it's raining.) The only clothes you put on are tank tops, shorts and sandals. And who's ever heard of wool and boots? Now let my mind fly back to where I am now, Italy. When I go to the fruit and vegetable stands, the first thing I notice is the welcoming colors of berries. They are irresistible and just beckon you to grab the punnets and think of berryland. I had been living in berryland lately. Punnet after punnet, I managed to fill up our fridge with berries. For that reason, bear with me and my berry fixation. The possibilities with frutti di bosco (berries) are endless and I can't hold up my hand and stop myself from whipping up things in the kitchen. 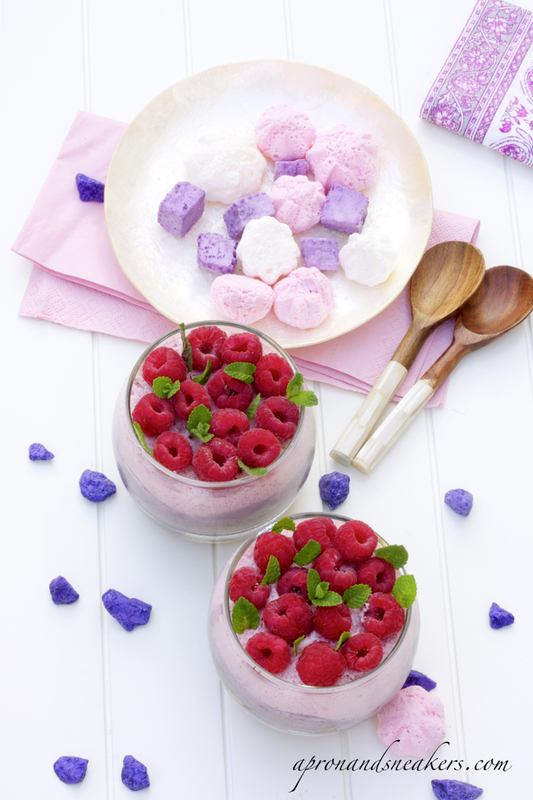 I thought of this berry mousse to give to the kids for their afternoon merenda (snack) to give their usual bread and honey a pleasant change. Lately, my Il Cucchiaino d'Argento Cookbooks for kids have been inspiring me to prepare so many things for the kids. I followed a chocolate mousse without cream recipe that I abandoned altogether when I realized that chocolates and fruits are completely different ingredients and require different treatments in preparing the mousse. After a quick research, I learned that I would be needing cream to make it smoother and gelatin to make the mousse settle. I added both ingredients and I thought of adding the savoiardi biscuits (ladyfingers) to cushion the two kinds of mousse. After a couple of hours in the fridge, the mousse settled and I had two happy kids plus the happy parents polishing off four glasses or mousse. 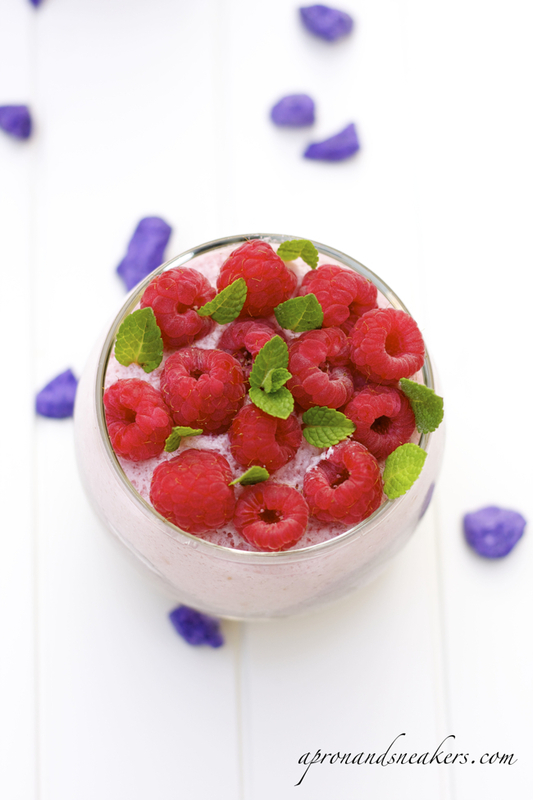 Mash raspberries & blueberries separately in a blender. Set aside. Whip cream until soft peaks form. Set aside. Put water and sugar together in a small saucepan. Let it boil. Cook for about 5 minutes. Add agar agar. Let it simmer for about 3 minutes while whisking. In a bowl, beat egg whites and a pinch of salt until stiff with a hand electric mixer. Pour hot syrup gradually on the egg whites. Continue beating the egg whites until it cools down, about 5 minutes. Fold in whipped cream. Mix well. Divide mixture equally and put them in separate bowls. 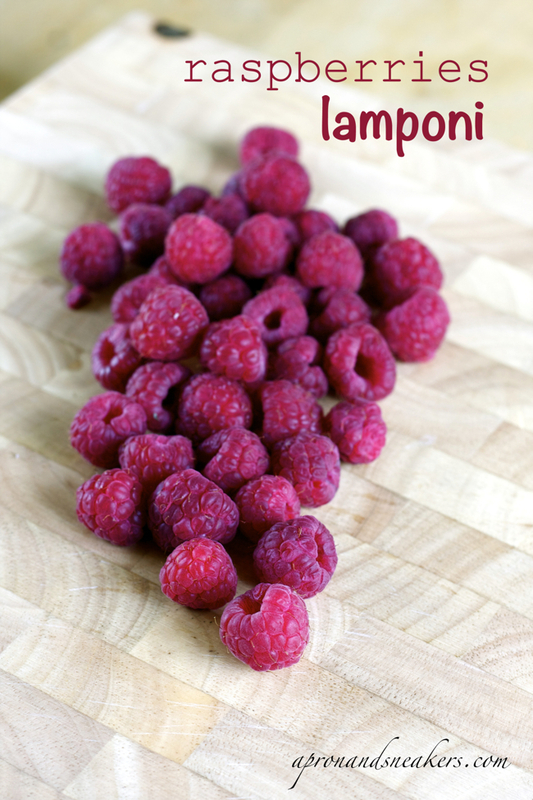 In one bowl, fold in mashed raspberries. 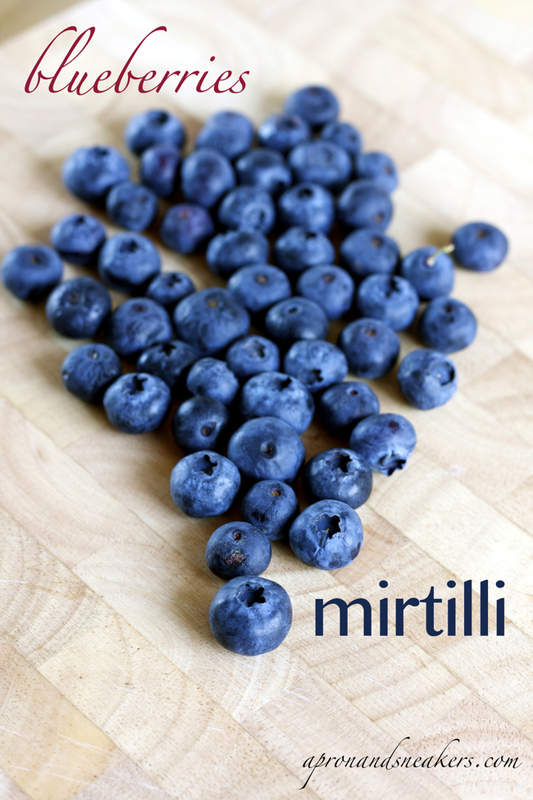 In another bowl, fold in mashed blueberries. In the serving glasses, Put 2 savoiardi biscuits at the bottom. You can cut them to make sure you fill up the whole bottom of the glass. Drizzle 1/2 teaspoon of Creme de Cassis on the savoiardi biscuits. 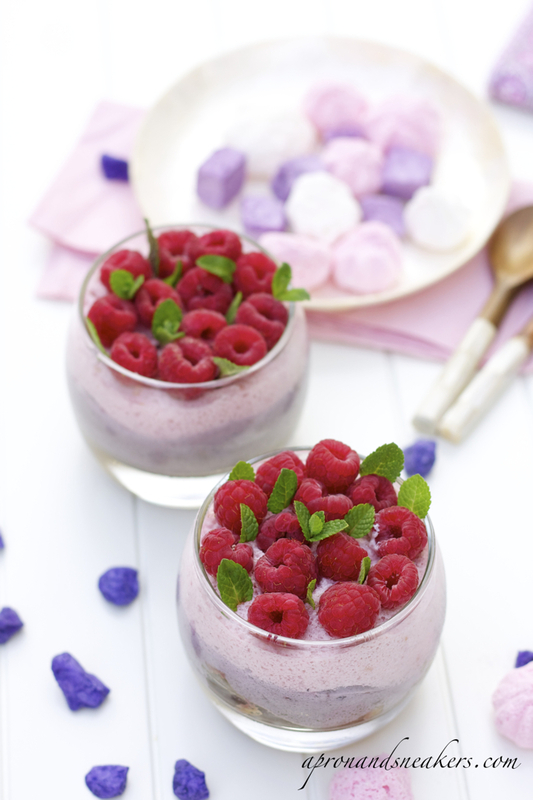 Pour blueberry mousse until the middle of the glass. 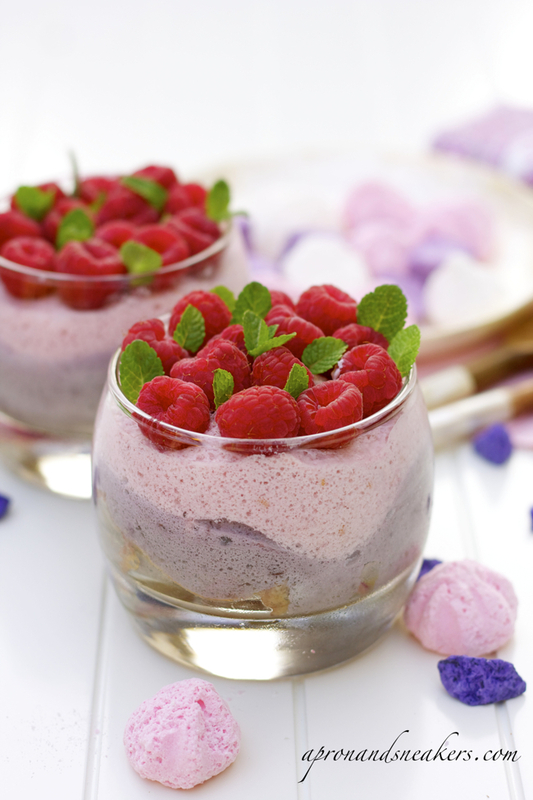 Pour raspberry mousse until the rim. Refrigerate for at least two hours to set. 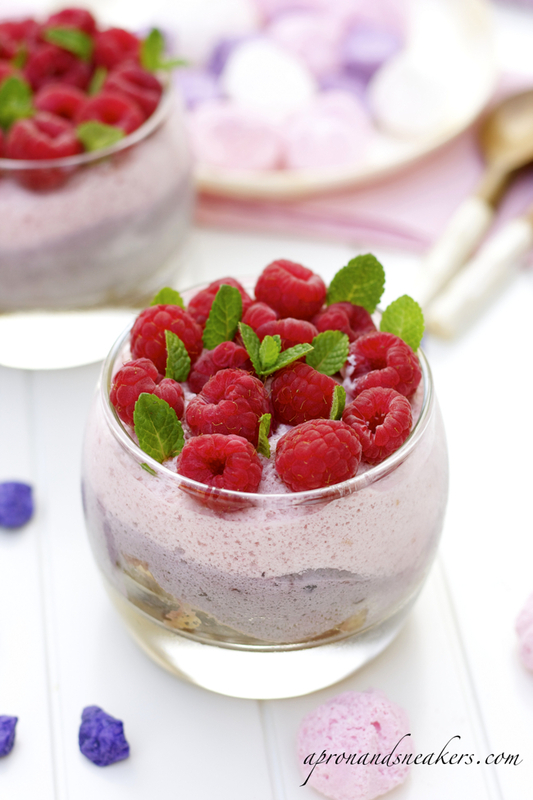 Garnish with the fresh berries on top and some mint leaves.